Piaseczno is with about 67.000 inhabitants a middle-sized municipality, located in the centre of Poland and in the direct neighbourhood of the southern part of Warsaw. It is the seat of the county authorities. Due to the vicinity to Warsaw the neighbourhood is a typical suburban residential area characterized by middle sized apartment buildings and a high number of open green spaces between the buildings. A significant share of the residents used to work in a nearby factory but due to the reduction of labour force a relatively high number of inhabitants was laid-off. This cause to some extends social tensions. Despite the fact that the Target Area is located in a rapidly developing district of Piaseczno, the development pressure on the neighbourhood itself is rather low and therefore the emphasis on future activities lays on the stabilization and enhancement of residential environment. Apart of four refurbished building, the energy performance of the existing building stock is rather poor with an urgent need for improvement. The entire Neighbourhood is connected to a central heating system that supplies the area with heating energy. However, the warm water supply is organized by apartment-related individual boilers and the project targets on the development of new integrated solutions regarding a combined heat, warm water and energy production. Major challenges regarding the urban structure of the neighbourhood is the improvement of the quality of the open spaces in terms of social use and security. Due to the strong rise of the private car ownership, in comparison to the construction period, there is a need to develop appropriate solutions for the internal traffic and parking solutions. 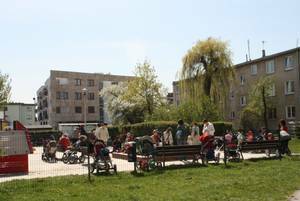 The residents are showing their strong commitment to take over responsibility for the green areas in between the buildings by self-organized gardening activities. 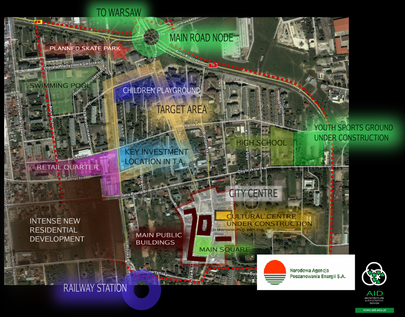 The municipal administration considers the development of the integrated development concepts within the frame of the project as driving force to engage both, local owners and the municipality to initiate working, communication and decision patterns for the overall development and in particular for the enhancement of the energy efficiency of the neighbourhood. On behalf of the city of Piaseczno the Polish National Conservation Agency (NAPE) develops an integrated concept for the energy efficient upgrading of the neighbourhood. Parallel to the energy related topics, the concept takes in account as well the aspects for a general improvement of the residential environment in the neighbourhood and will come up with a prioritized package of measures for a general accompanying up-grading of the area. The concept becomes, after the approval by the city council, a local bylaw. Based on the integrated concept the city implements the prioritized package of measures for the public space. To enable the self-organized enhancement of the buildings in the neighbourhood, the concept includes as well detailed proposals for the technical upgrading of the 26 buildings in the quarter as well as financial supporting resources for the owner associations and housing cooperative respectively. In the frame of the project work all buildings are the subject to an energy audit in order to provide to the owner a solid basis for tailor-made further refurbishment activities in respect to the special conditions in the neighbourhood. The focus of the enhancement of energy efficiency is on one hand the modernization of the building shells and on the other hand the development of more adequate solutions for the up to now apartment-related warm water supply. 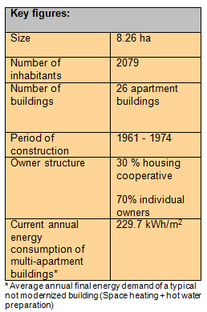 Due to the specific conditions of the district heating system (seasonal heat production only and difficult property rights) the emphasis of the possible solution approaches lies on decentralized building-related co-generation devices. Based on a survey among the residents of the neighbourhood the focus of the upgrading activities of the residential environment is on the improvement the amenity value in front of the local supermarket and the enhancement of the green areas in between the buildings.